This slow cooker kielbasa and sauerkraut is flavorful and made with just the addition of beer and brown sugar – easy, delicious and perfect for parties! Years ago, my husband and I went to his friend’s house for a 4th of July cookout. He mentioned there was kielbasa and sauerkraut (which I typically pass right over), and as a footnote said that they were cooked in beer and brown sugar. My ears shot up faster than a dog who hears a bread bag being rustled (or a peanut butter jar open, or a banana being peeled, AHEM). I had to try it, even though I still kind of thought I wouldn’t really be crazy about it. Forget being crazy about it, or even liking it, I loved it. Afterward, I was sorry that I had filled up on so many side dishes because I was dying for another sandwich but was too full. 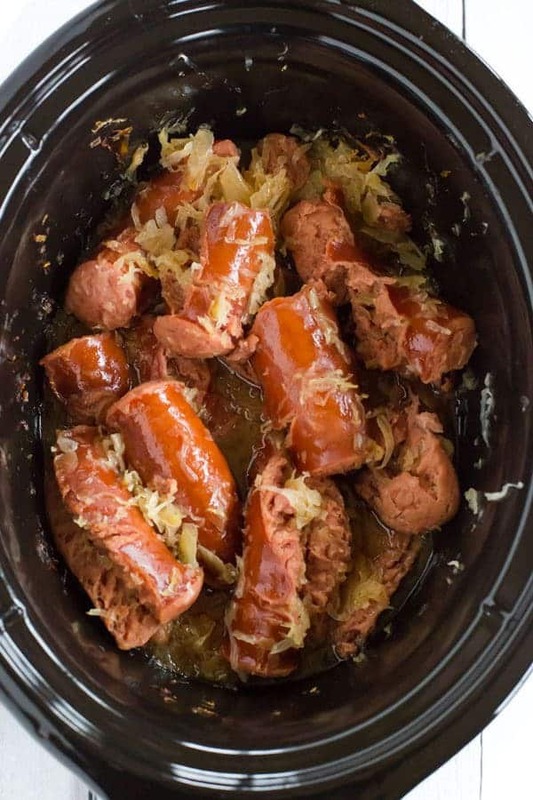 A few months later, we were STILL talking about that darn kielbasa and sauerkraut, and since it was now football season (perfect for crock pot meals), we got the recipe from his friend to make ourselves. We have since made it, seriously, COUNTLESS times. I’ve lost track. This recipe honestly couldn’t be any easier to make – less than 10 minutes to get everything into your slow cooker, and then let it do the work. As with most things like this, the longer you let it cook the better it will taste. 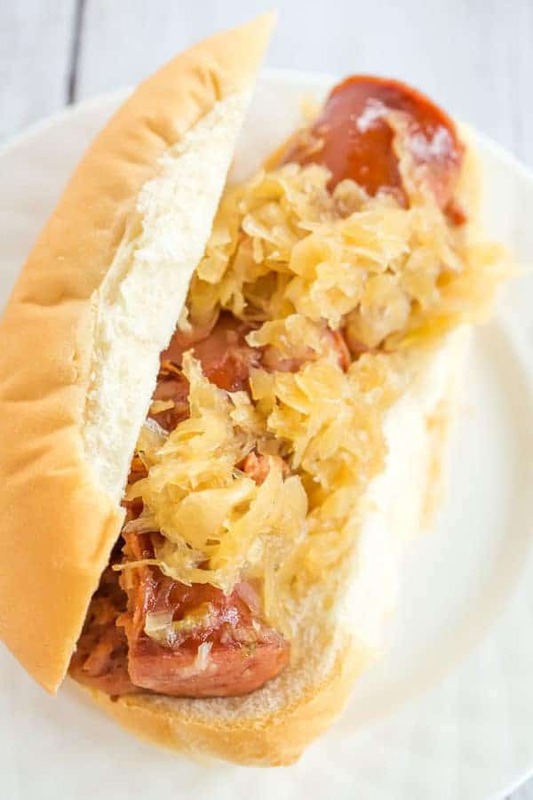 The kielbasa becomes so tender that it melts in your mouth, and the sauerkraut takes on a caramelized, sweet flavor – delicious! If you’re a kielbasa and/or sauerkraut-averse person, take it from one of your brethren – you NEED to give this a shot! This is perfect for football game days, your upcoming Super Bowl party, New Year’s (your pork/sauerkraut is covered! ), or any other gathering. Enjoy! 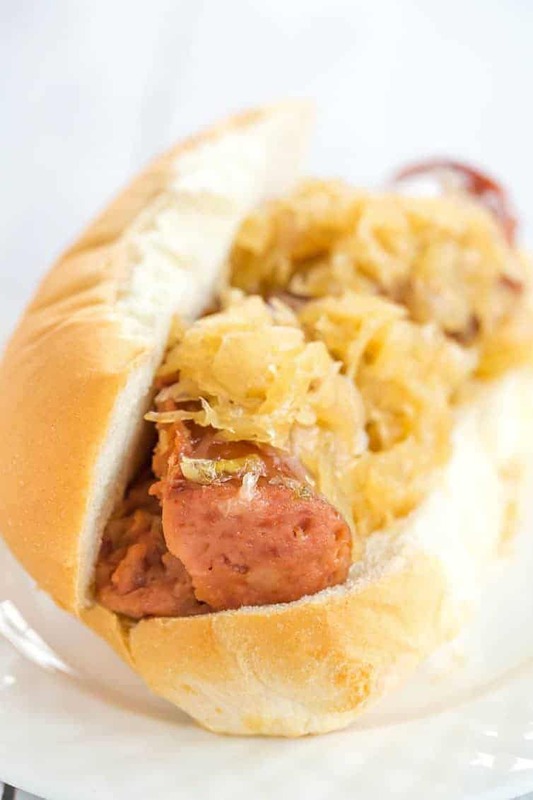 Beer and brown sugar make this kielbasa and sauerkraut an amazing meal - easy, delicious and perfect for parties! Combine the beer and brown sugar in a small saucepan over medium heat, and cook, stirring occasionally, until the sugar melts and the mixture is slightly thickened; set aside. Cut the kielbasa into links and place in a slow cooker. Cover with the drained sauerkraut. Pour the beer and brown sugar mixture over top. Cook on high for 4 to 6 hours, or on low for 8 to 10 hours. Serve on its own or on your favorite sandwich roll. The beer can be from a can or bottle, and you can use whatever you usually drink or keep on hand. I've made this with everything from Miller Lite to Lebatt, Guinness, Heineken, you name it! They all work just fine. The brown sugar can be light or dark. The sauerkraut can be from a can, jar or bag - just make sure you drain it well. This recipe was originally published on October 14, 2011. I used the garlic kielbasa available at Costco (guaranteed to be the best kielbasa you’ve ever had or your money back) and some good beer (Sam Adams or Red Bridge if making a gluten free meal) along with high quality (preservative free) sauerkraut and cooked it on high for at least 4 hours in my crockpot for Christmas dinner (each year we pick a different nationality of food to make, last year was Polish food) and it turned out so tender and flavorful. Everyone loved it. I’ve made it numerous times since. So easy and time saving! I made two modifications and this is now my new “go-to” saurkraut dinner. I added a good-sized cubed red apple (mainly because it’s how my German mother taught me) and cut the brown sugar to half cup based on reviewers who said this was too sweet). That was a good call, btw. I cannot imagine how sweet it’d be had I used a whole cup. I used bagged kraut, drained (Tip: do NOT rinse!). Do you have to boil fresh kielbasa before adding it to the crock pot and then cooking it for 6 hours? Do you need to boil the fresh kielbasa first? Worst kielbasa and sauerkraut recipe I’ve ever tasted. Way to much sugar! And I mean “way too much”!!! Kraut ended up so sweet it was inedible. 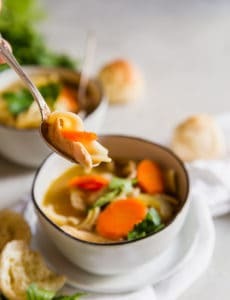 #1 I can’t believe how many years the reviews, comments or questions go back on just this recipe! Hi Pat, I have a 6.5 quart slow cooker and a double recipe does fit in mine. If you have a smaller size slow cooker it might be a tight fit! What is the “Nutritional value” of a serving of this recipe? Hi Mike, I don’t have the nutritional value, but you can calculate it on a number of sites like My Fitness Pal. 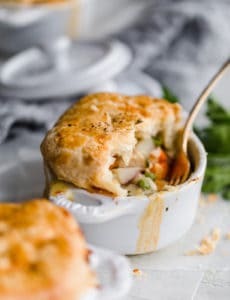 This is a fantastic recipe!! !